THE mystery fire on Hazle Marland's Gaeta property is still burning - just like the questions about what started it. On Friday emergency crews rushed to Mrs Marland's property after reports something had fallen from the sky and started a fire. Crews were quick to rule out the possibility of a plane crash, but speculation about the cause goes on. “It's still a mystery, there are a lot of rumours floating around but because it is so inaccessible I really don't think that we're ever going to get to the bottom of it,” Mrs Marland said. She said she had been inundated with phone calls on Saturday from media organisations and spectators wanting to go up to the site, as the news of the fallen object spread around the world. “I was just astonished that they would show such interest,” Mrs Marland said. She said she hoped life would return to normal on the property, which is used for grazing cattle. “I'm not encouraging anybody (to visit the site), because there is nothing to see,” Mrs Marland said. Bundaberg Astronomical Society member Don Gray said he suspected the mystery object was a meteor, and the lack of an impact crater did not rule it out. “It would be very small, depending on the weight of it or what it was, whether it was metallic or just rock, whether when it hit the ground it exploded and dug up a lot of earth,” Mr Gray said. He said tens of thousands of meteors, dust and space junk fell to earth every year, from pieces of old satellites to tools dropped by astronauts working on space stations. “Most of it has never been found,” he said. A spokeswoman from UFO Research Queensland said her members had heard reports of flashes of lights and falling objects, but there was no clue what it may have been. 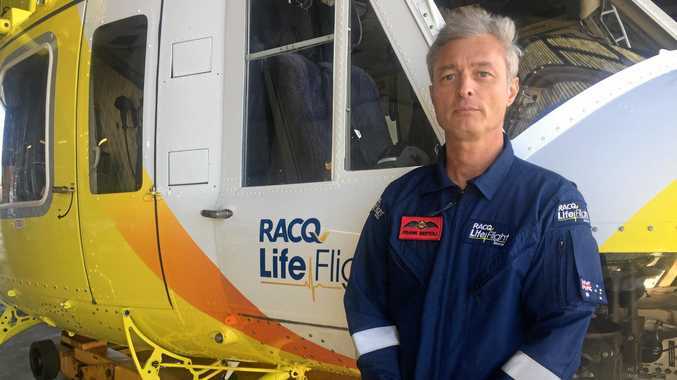 News A LIFEFLIGHT pilot and paramedic have told of the rescue on Fraser Island this morning after a boy was taken from his family's camper trailer by a dingo.